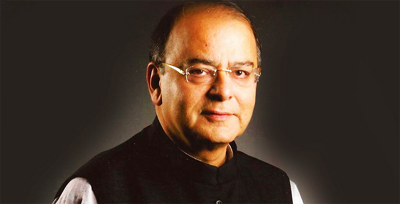 Finance Minister Arun Jaitley today on 28th February 2015 has announced a budget for the financial year 2015-2016. According to him this budget is aimed at high growth, saying the pace of cutting the fiscal deficit would slow as he seeks to boost investment and ensure that ordinary people benefit. Reduce in corporate tax from 30% to 25% over the next four years, starting from next financial year. Limit of deduction of health insurance premium increased from Rs 15000 to Rs 25000, for senior citizens limit increased from Rs 20000 to Rs 30000. Senior citizens above the age of 80 years, who are not covered by health insurance, to be allowed deduction of Rs 30000 towards medical expenditures. Deduction limit of Rs 60000 with respect to specified decease of serious nature enhanced to Rs 80000 in case of senior citizen. Limit on deduction on account of contribution to a pension fund and the new pension scheme increased from Rs 1 lakh to Rs 1.5 lakh. Additional deduction of ` 50000 for contribution to the new pension scheme u/s 80CCD. Conversion of existing excise duty on petrol and diesel to the extent of ` 4 per litre into Road Cess to fund investment. To mitigate the problem being faced by many genuine charitable institutions, it is proposed to modify the ceiling on receipts from activities in the nature of trade, commerce or business to 20% of the total receipts from the existing ceiling of ` 25 lakh. Evasion of tax in relation to foreign assets to have a punishment of rigorous imprisonment upto 10 years, be non-compoundable, have a penalty rate of 300% and the offender will not be permitted to approach the Settlement Commission. Non-filing of return/filing of return with inadequate disclosures to have a punishment of rigorous imprisonment upto 7 years. Undisclosed income from any foreign assets to be taxable at the maximum marginal rate. Mandatory filing of return in respect of foreign asset. Entities, banks, financial institutions including individuals all liable for prosecution and penalty. Acceptance or re-payment of an advance of Rs 20,000 or more in cash for purchase of immovable property to be prohibited. PAN being made mandatory for any purchase or sale exceeding Rupees 1 lakh. Third party reporting entities would be required to furnish information about foreign currency sales and cross border transactions. Additional investment allowance (@ 15%) and additional depreciation (@35%) to new manufacturing units set up during the period 01-04-2015 to 31-03-2020 in notified backward areas of Andhra Pradesh and Telangana. Rate of Income-tax on royalty and fees for technical services reduced from 25% to 10% to facilitate technology inflow. Basic Custom duty on certain inputs, raw materials, inter mediates and components in 22 items, reduced to minimise the impact of duty inversion. All goods, except populated printed circuit boards for use in manufacture of ITA bound items, exempted from SAD. Monetary limit for a case to be heard by a single member bench of ITAT increase from Rs 5 lakh to Rs 15 lakh. Wealth-tax replaced with additional surcharge of 2 per cent on super rich with a taxable income of over Rs 1 crore annually. Domestic transfer pricing threshold limit increased from Rs 5 crore to Rs 20 crore. Excise duty on footwear with leather uppers and having retail price of more than Rs 1000 per pair reduced to 6%. Excise duty on sacks and bags of polymers of ethylene other than for industrial use increased from 12% to 15%. Direct tax proposals to result in revenue loss of Rs 8315 crore, whereas the proposals in indirect taxes are expected to yield Rs 23383 crore. Thus, the net impact of all tax proposals would be revenue gain of Rs 15068 crore.